Westerham is the perfect mix of beautiful countryside and picturesque, charming market town, so close to London that you will be at the Games in under an hour. Sadly the Torch will not pass through the town but our proximity to events keeps interest very buoyant. Visitors will also be able to enjoy some of the rich culture of Sir Winston Churchill’s chosen home by just walking round town, with our boutique shopping, listed buildings, and array of restaurants, cafes and pubs. Tour Chartwell, Quebec House (birth place of General Wolfe) or Squerryes (recently featured in the 2009 BBC production of Jane Austen’s Emma.) Day trips to cosmopolitan London contrast with wonderful rural Kent on the doorstep, and a rich choice of Castles and Gardens to visit nearby makes Westerham a perfect base for visitors in 2012. 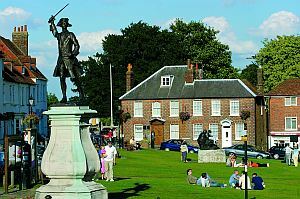 Westerham is ideally placed to host visitors wanting to attend the Olympics. Gatwick airport is our major international hub, with hundreds of flights a day, and just 20 minutes by car from Westerham. Trains from Sevenoaks, Bromley and Oxted will deliver you to the heart of London, and to the Games in under an hour. The official Park and Ride for the Olympic Park will be Ebbsfleet, north Kent, near Bluewater, delivering Kent and Continental residents to the heart of the Olympic Park in just 9½ minutes. The Torch is missing Westerham out on 20th July, preferring the M25 to enter Surrey, so Westerham has organised its own Torch Relay, to celebrate the passage of the real thing in 1948. School Mums are organising the relay runners: it will start from Sundridge and finish in Moorhouse. Our torch will arrive on The Green at 3pm, and will come together with the local Schools’ torch which will have processed up, along with Churchill schoolchildren and parents. It is Judy Duffield’s last day at school so she will officially be retired by the time she reaches The Green! Michael Fallon M.P. will conduct a small ceremony, and some of our residents who remember 1948 will be on hand in vintage cars, to chat. We also hope to have a small exhibition of 1948 when the Olympic torch last came through. The Westerham Bell ringers will be ringing the Olympic 5 Ring Doubles in to herald the arrival of the torches. 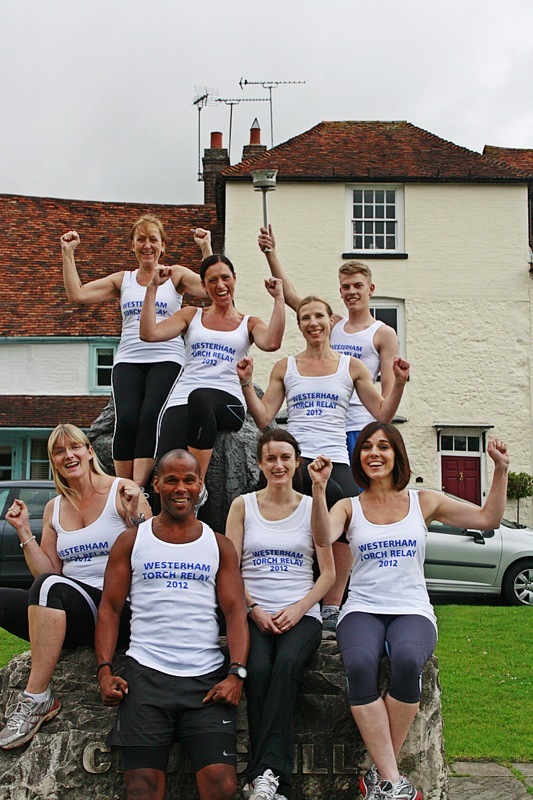 Many thanks to MoorEnergy for providing the runners, sponsoring their T shirts and for contributing to the Relay Torch, and to the Westerham Town Partnership for Posters and Publicity. Let us make this a great event, so Westerham can hold its head high after being left out of the Olympic Torch route! Click for larger poster advertising our event. Peter Finch has made a shot film reminiscing about seeing the 1948 torch carried by Arthur Galloway through Westerham which you can view here: www.youtube.com. A couple of pictures from the 20th July Torch Relay photo shoot. 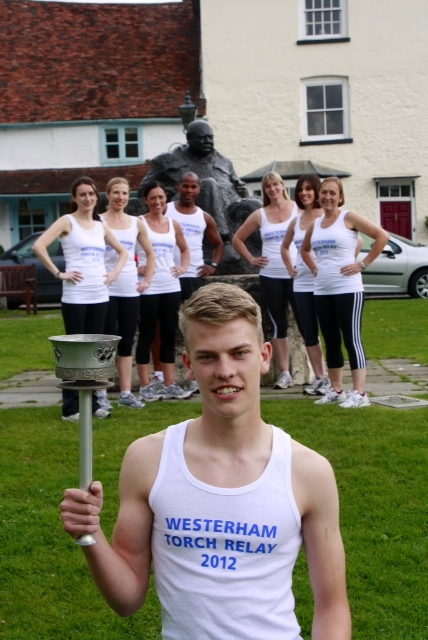 The young man with the torch is Jack, grandson of Arthur Galloway, who will be running on 20th July into Westerham. The rest are led by Nigel Moore from MoorEnergy Club. Westerham was unlucky not to be on the Olympic Torch route but a local resident, Peggy Hughes, has been chosen to help carry the Torch in the South East. Peggy was struck down with the rare disease transverse myelitis three years ago. The disease affects the central nervous system and she was paralysed from the waist down. After extensive physiotherapy for seven weeks, she now struggles with long distances and uses a walking stick. Her husband Duncan nominated her to carry the Torch for her bravery and positive attitude. The London 2012 Committee has assigned her to go through Hastings with the Olympic Torch on Wednesday July 18th. 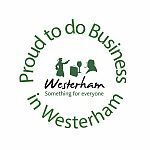 Peggy says she is thrilled and excited to be given this amazing once in a life time experience and she will be proud to represent Westerham. She may not be able to run but she says she can walk very fast and even crawl if she has to! Peggy, who is a grandma and originally from California, is very well known in Westerham having lived here for 15 years. Pupils from Valence School will be formed part of the Guard of Honour at the Opening Ceremony of the Olympic Games. They held up lanterns and banners they have made to support Haiti in the Athletes’ Parade, which is a great honour considering only 249 schools were chosen out of 23,500 applicants! The story has already hit the headlines, please see www.thisiskent.co.uk. While all eyes have been on the Paralympic Games, some of team GB’s most ardent supporters have come from Valence School, near Westerham, Kent. 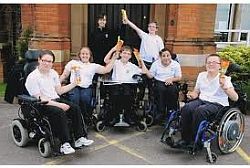 The school, which offers top sporting facilities and an academic education to children and young people with physical disabilities from all over the South East, is a Specialist Sports College. Groups of its students attended the Paralympics every day throughout the Games and were inspired by the achievements of all the athletes. The school’s participation in the Olympics got off to a flying start when eight students were invited to support Haiti and be among thousands of children lining the route to the stadium on the night of the main Olympic opening ceremony back in July. The last time London hosted the event was the XIVth Olympiad in 1948, and the Flame of Peace was carried through Westerham en route to Wembley Stadium. This was the first Olympiad to be held since 1936. The 1940 and 1944 Olympics were not possible due to the Second World War. The Torch had travelled through five Continents since leaving Mount Olympus two weeks previously, then on the overnight ferry from Calais to Dover. On arrival at Dover before dawn, the reception was tumultuous with a crowd of 50,000 people awaiting the Torch’s arrival, and without delay was on its way through the County of Kent. Various runners throughout the route had the honour of carrying the Flame at roughly two mile intervals following a route via Maidstone up the A25 to Wrotham and Borough Green. Then on it came through Seal, Sevenoaks, north to Riverhead and on to Sundridge, and Brasted, arriving in Westerham in the first light of dawn. On the Borough Green to Westerham leg, hundreds, if not a thousands, had risen from their beds at dawn to witness the event and to line the route. The Westerham section from Brasted to the County boundary saw people gathered from Beggars Lane all along to Westerham High Street. The Market Square was jam-packed with people. It was just after 6am when the Flame came through, carried by our top Westerham Harrier, Arthur Galloway, who also trained with the South London Harriers, en route to Wembley Stadium. He carried it from Sundridge to Moorhouse. The runners were escorted by a police motor cyclist with a long trail of cars following, but through Westerham it was an A.A. man on his motorcycle combination. To an young observer on the pavement,, it was barely ten seconds of seeing our man pass by but a sight that is still a treasured memory. It is thought that never before or since July 29th 1948 had so many people assembled in Westerham at 6am. Who knows, maybe 2012 will see a repetition of this amazing event! More photos from Surrey archives, including Limpsfield Chart shots, can be viewed here http://www.flickr.com. Those of an upper age group may well remember 29th July 1948 when the Olympic Torch passed through Westerham en route from Dover to Wemblety Stadium for the opening ceremony of the 1948 London Olympics. On this occasion the torch was relayed through Kent from H.M.S. Bicester who had collected it from Calais. The torch travelled day and night to its destination, being relayed by chosen athletes. Alan Dyer, a Dartford harrier brought the flame from Riverhead to Beggars Lane junction on the A25, where Arthur Galloway was waiting. Arthur had qualified to carry the torch through the Westerham section because he was the top athlete in the Westerham Harriers Club Arthur ran to the county boundary with Surrey, at Moorhouse. It was just breaking dawn when Arthur collected the torch from Alan Dyer, and at about 6am he passed through Westerham holding the torch flame aloft. We in Westerham knew it was coming, and it seemed that half the population of Westerham had gathered along the A25 – our Market Square was jam packed with onlookers. We all cheered and clapped as Arthur passed through. Never have so many people gathered in Westerham at 6am and I don’t suppose they ever will again! Peter Finch talks about his memory of the Torch through Westerham in 1948 at http://www.youtube.com. If you’d like to see the passage of the real Olympic Torch, it passes close by on the 20th July, taking to the M25 from Sevenoaks at Junction 5 and emerging again at Junction 6. For more details see www.london2012.com/. Brands Hatch has secured the Paralympic Cycling Event 5th – 8th September 2012 (tickets on sale 11th September 2011). Wanted! Volunteers to become Kent Games Time Greeters. Be part of The London 2012 Olympics – we are looking for an army of volunteers to offer a warm welcome, share their love of Kent and of their local area with visitors and local residents. Volunteers will provide 2012 Games related information from the Kent leg of the Torch Relay through to the closing ceremony of the Paralympic Games. Volunteers will be located at key travel hubs including Ebbsfleet International, at the Paralympic Road Cycling Event at Brands Hatch and at key points along the Torch Relay route including the overnight stops in Dover and Maidstone. Volunteers are required between 17th July and 9th September and must be able to commit to a minimum of three sessions of volunteering, each session lasting up to six hours. Training will be provided with successful volunteers being required to commit to 2 days of training which will take place at various locations across Kent in June. A uniform will be provided. Applicants are required to be 18 years of age or above by 1st January 2012. Applications are invited throughout May with training taking place in June. For further information visit our website www.visitkentbusiness.co.uk. Do you want to be part of the 2012 Paralympic Games locally? Local people are being given the unique ‘once in a life’ opportunity to help out at the Olympic Torch Relay on the 20th July and the Paralympic Games Road Cycling at Brands Hatch between the 5th-8th September. You could be a key part of these events and all you need is a warm and welcoming nature and enjoy engaging with new people. The District Council, in partnership with Volunteer Centres in the Sevenoaks District, are looking for Volunteer Event Stewards to help spectators enjoy their 2012 Games experience and provide a welcoming and lasting legacy for visitors to our District. Volunteers need to be over 18 years old. Full training will be provided and a uniform which you will be able to keep as a souvenir.For further information telephone the Council on 01732 227000, visit www.sevenoaks.gov.uk to register your interest.